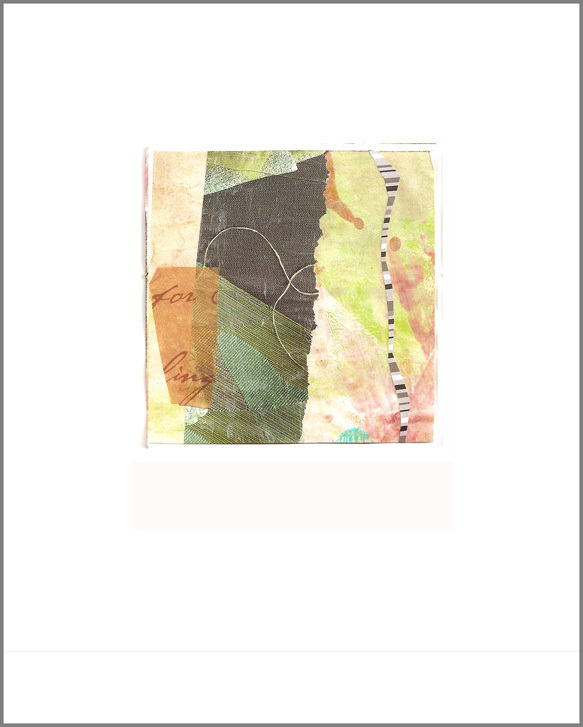 This collage is 4 x 4″ and is mounted on 10 x 8″ heavy acid free paper for a larger border. After creating quite a few 5 x 7 collages over the weekend, I went back to the composition matrix and created some 4 x 4 compositions. I found a clear 4 x 4″ acrylic square that I used as a template to trace the squares onto the background design. This reminds me that I need to cut a 5 x 7 piece for the same purpose. I’m now fantasizing about going much bigger with these. I have a few small odd size paintings on paper which I am thinking of mounting. If I may ask, what do you use to adhere the artwork to the heavier paper? Do you use acrylic medium or acid free tape? I make and use templates to help save time, to adhere to standard sizes for matting and for a “quick see” when cropping the pre-printed backgrounds I’ve been using. Chewy, I feel that making art in standard sizes just makes it so much easier for the collector looking for an inexpensive way to frame. You can mount your art onto a backing with a dry mount machine, but it’s easy just to use fusible webbing (like Wonder Under) for fabrics. It works just as well on good paper as it does on fabric! In these economic times any way to cut costs sounds good to me… so I try to fit standard sizes. I don’t sew, so I haven’t heard of Wonder Under. Thanks, I’ll Google it.